Rucker Equipment Kubota MX5200 HST Package Deal | Rucker Equipment Co.
HST Transmission: Kubota's new MX5200 model features a hydraulic servo HST systems that increases pedal responsiveness, and ease on pedal-shifting for smooth performance and improved control, regardless of load size. Forward and reverse directional changes are simple. HST also reduces shock, vibration, noise and fatigue to improve tractor performance and operator comfort. Cruise Control is standard, a great feature for mowing applications; just preset your travel speed then remove your foot from the HST pedal. High-Back suspension Seat: Work has never been this comfortable. The new suspension seat with a high seatback offers greater comfort and minimal back fatigue even after a long day’s work. The luxurious design is also pleasing to the eye. Large Capacity Fuel Tank: The MX5200 features a 13.5 gallon fuel tank. 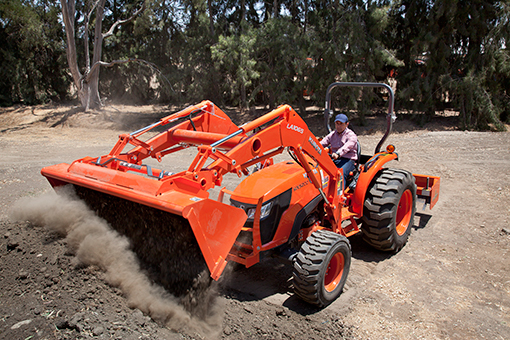 Operate longer between fill ups with the large capacity fuel tank on the Standard MX-Series. Easier cleaning and Maintenance: The new MX Series is designed to make daily maintenance easy. For fast cleaning, the radiator screen can be removed from either side of the tractor. The air filter, battery, tray, and coolant recovery tank are readily accessible. 3-Point Hitch: The powerful Category II 3-Point Hitch is convertible to Category I easily handles correctly matched Implements. Rigid link ends are standard on the MX4800 and MX5200F models, with telescoping link ends and stabilizers on the MX5200 and MX5800 4WD models, such a great feature. An upgrade kit is available for the MX4800 and MX5200F 2WD models. The telescoping lower links make hooking up and working with large implements easier. Financed thru KCC*, zero-down, with extremely low APR financing (typically less than 1% APR): $40,335.00 minus $4,250.00 equals $36,085.00 or about $601/month for 60 months. *W.A.C Photo for illustrative purposes only. Optional equipment may be shown in photo.